Bobby Orr was a terrific hockey player in the 1970s, but it was as a Bruin. He would sign with the Blackhawks as a free agent in 1976 and proceed to play only 28 games over the next three seasons due to knee problems. He would then retire. In fact, according to Orr, he never even cashed a paycheck from the Blackhawks, because he was paid to play hockey, and he wasn’t playing for the Blackhawks. But maybe he got a cut of that guy’s jersey. 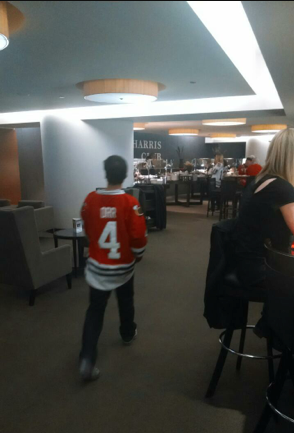 This entry was posted in Chicago Blackhawks, Photo Of The Day and tagged Bobby Orr by Tom Fornelli. Bookmark the permalink.